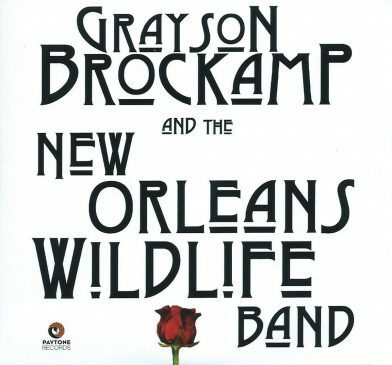 It’s difficult to effectively walk the line between modern jazz and gospel music in a way that comes across as genuine to both, but that’s exactly what Grayson Brockamp has done on his EP with the New Orleans Wildlife Band, co-produced and released by Nicholas Payton’s Paytone Records and featuring some of the older local young lions of jazz backing the justifiably acclaimed gospel singer/keyboardist Bailey Hinton. Covering ground from the 1960s Blue Note recordings of Wayne Shorter, Herbie Hancock and Elvin Jones to praise and worship music, and the blazing fast horn solos of big band bebop to heartfelt ballads treated with the sensitivity and reverence of hymns, all in a mere 16-minute release, is a daunting task that Brockamp makes sound easy, to say nothing of the world-class quality of his bass playing. More impressive still are the organic stylistic transitions between the fast and slow, dense and sparse, quiet and loud, and even sacred and secular—all beautifully blended and blurred, never forced or jarring. The purposely unresolved chord at the end of the final song feels like an unanswered question, and leaves one craving the full-length album that I’m told is presently in the works.